THE TENT is a summer-hostel. The FLOOR - the original THE TENT. The most economical way to stay anywhere in Munich or around. Foam mats and blankets are provided. BUNK BED - THE TENT dormitory, the original Tent upgrade: more than 600 m² in size, filled up with backpackers from all over the world, creating a unique atmosphere. We provide blankets and bed-sheets. 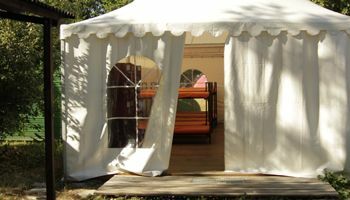 We offer a special tent with bunk beds for groups from 15 up to 26 persons. Reservation necessary! The Cafeteria serves breakfast at an inexpensive price between 7 a.m. and 10.30 a.m., snacks throughout the day and dinner in the evenings. There are no extra fees for showers or using the guest-kitchen. Also the lockers are free, just bring your own lock or buy one at THE TENT.